If are here on this page then this is for sure that you are interested in learning Yoga by yourself. Instead of spending huge sums of money for yoga studios, you can use Yoga apps to practice yoga wherever you want and whenever you want. Practicing Yoga is not an easy task. You have to know about the right pose, right posture and time to hold that posture. The yoga at home app can help you in learning yoga methods. But choosing the right and best yoga app for weight loss, meditation or flexibility is a big task. Therefore, we have made this list of best free yoga apps (with an in-app purchase option) so that you can get the best yoga videos and tutorials for practice. You can try any of these top yoga apps for Android and iOS and become a yoga master. But remember, Yoga needs your patience. Here are the Best Bodybuilding Apps For Android And iOS if you have an interest in bodybuilding. 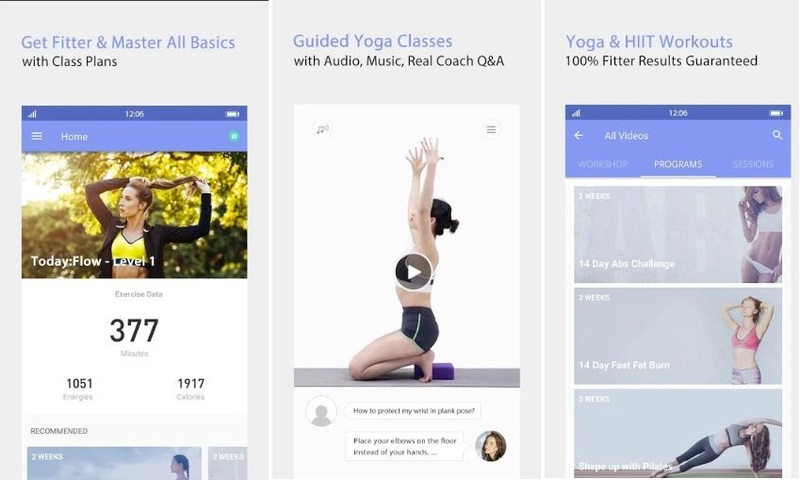 If you are also searching for how to get good at yoga by yourself then these best yoga apps for Android and iOS are for you. These are the best yoga apps for beginners, intermediates and advanced. Most of these yoga apps contain hot yoga, yoga for runners, power yoga, Bikram yoga and more. You can choose as per your need. 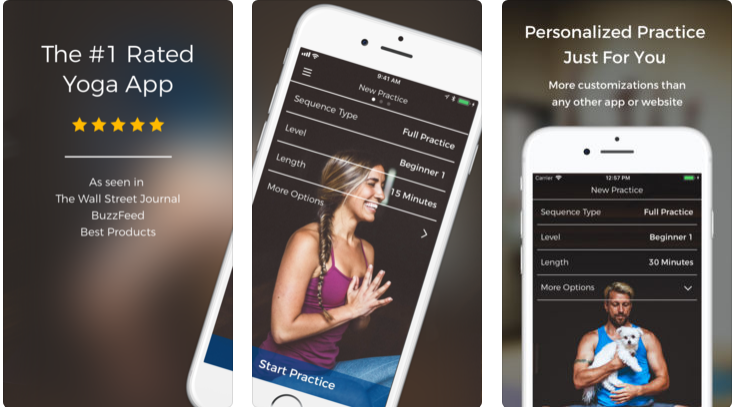 The Yoga Daily app is for all people, whether you are a beginner or advanced. 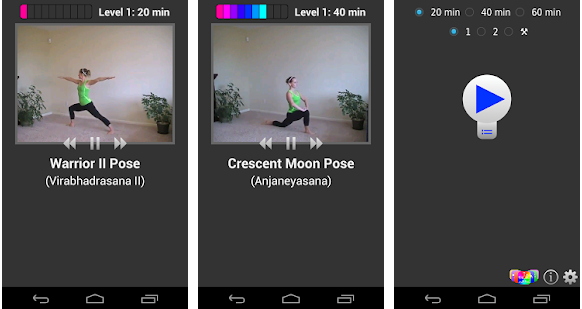 This yoga app has more than 200 yoga classes and 500+ poses with detailed voice instructions. 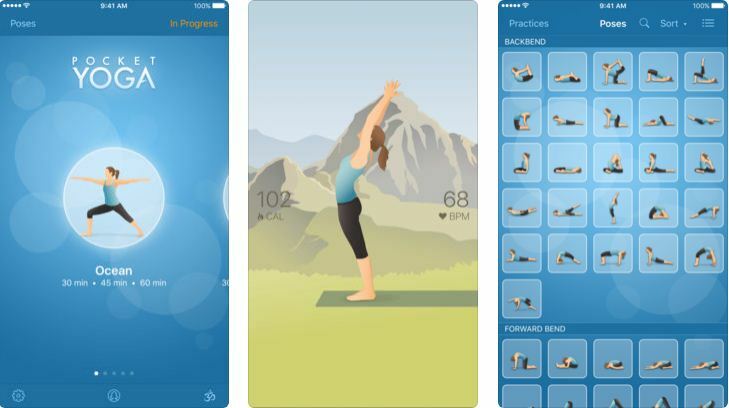 If you are searching for a yoga app for weight loss, this app is for you. The app has scheduled plans for boot camp, body toning, weight loss, strength, flexibility, relaxation, balance, menstruation, body detox, meditation etc. Here you will get step by step instructions for all yoga asanas. The app is available worldwide in 7 languages that are English, Japanese, Korean, Spanish, Chinese, German and French. The app offers in-app purchase but some classes are available for free. The Pocket yoga app has more than 200 beautifully illustrated yoga pose images with correct posture and alignment. It has 27 different sessions based on duration and difficulty of yoga. You can even play music from your music library in place of the default music on this app. The app tracks your practices and calories in order to track progress. The app is not available for free. You have to pay to use this app but the app is worth it. 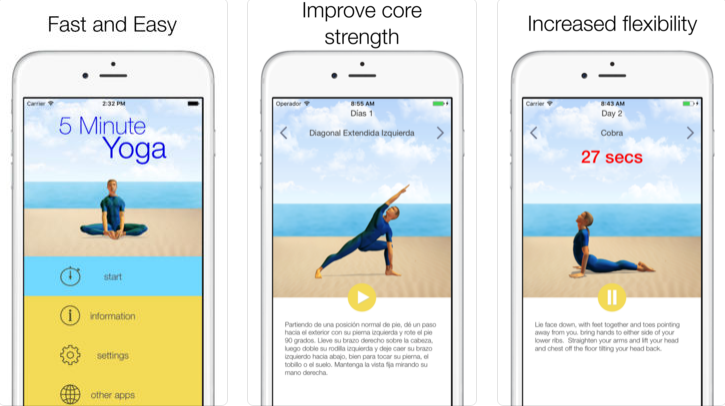 The yoga studio app is for all; beginner, intermediate and advanced. It has more than 80 Ready-made yoga & meditation classes in full HD video. You can create your own list of yoga and track your fitness growth with daily, weekly class scheduling. With this app, you can focus on your strength, flexibility, relaxation, balance or a combination of all four. The app offers in-app purchase. SOme videos are available for free but you have to pay for full access. Track Yoga app is another good yoga app that can help you to maintain good health and flexible body. All yoga classes in this app are tailored by yoga experts. You can get classes to lose weight, gain flexibility, fight depression or get a great workout in this app. This app also has an in-app purchase option. The SImly Yoga app contains a 20, 40 and 60 minutes of yoga routine with step by step explanation of each pose. The first level of this app is free for everyone. When you are ready to move to the next level, you can opt to purchase the full version of the app. The next level includes the second level of workouts, the ability to create custom routines, landscape mode, and no more ads. 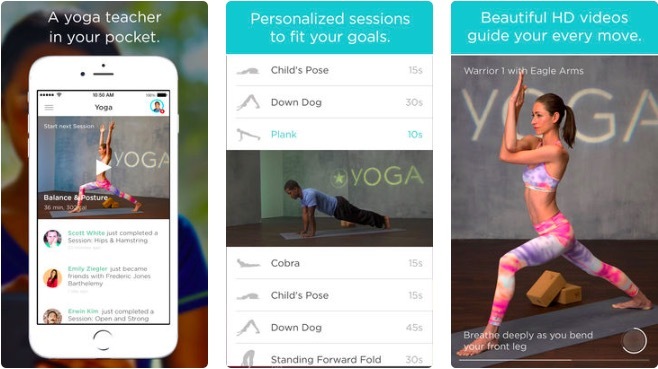 Down Dog is second yoga app in this list which is made by Editor’s choice. The first one is Daily Yoga App. This app has videos that can help you to learn yoga in a very easy way. You can learn yoga anywhere and any time with the help of this app. This app has some free videos but you have to pay for the full subscription. If you don’t have much time to practice yoga daily, this app has 5 minutes sessions of yoga for you. The app has quick and easy daily yoga workouts that you can perform in less time with maximum benefits. Every pose features clear images and detailed instructions ensuring all poses are performed correctly. This yoga app also has the in-app purchase option. FitStar Yoga is available only for iOS. This Yoga app helps you in working out on your fitness goals and become fit. The app offers HD videos of Yogas showing you proper way of doing different kinds of Yogas. You can choose the duration and intensity of each session. You can also track your progress and milestones with achievements. With the time, you can unlock new poses and badges. The can also connect your Fitbit, Jawbone UP, or MyFitnessPal account to automatically sync your weight and fitness activity. 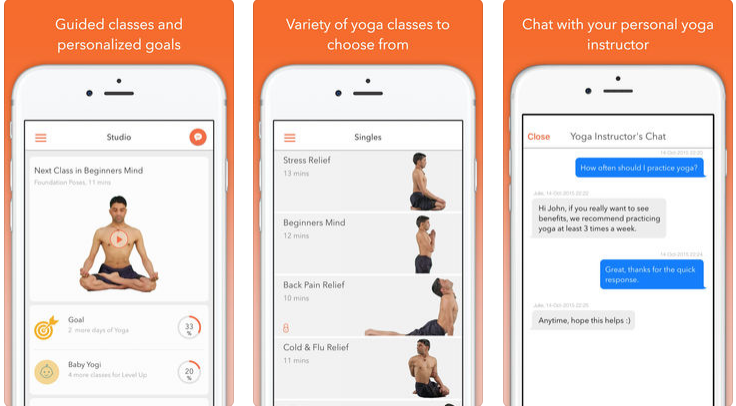 YogaGlo app brings yoga and meditation classes offline. 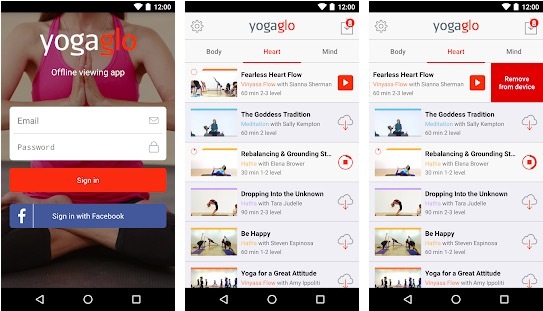 You can use the app to access YogaGlo videos and download on your phone. So, you can practice different yoga at home. All videos are in HD and delivers high caliber yoga classes. You also have an access to global community. The app has over 3,000 classes in a variety of styles, levels and durations. You can start with a 5 minute practice for stress reduction to a 90 minute energizing class depending on your choice. Pranayama is the collection of breathing exercise to keep the body healthy and prevent several diseases. But it is really important to know how to properly do Pranayama. The app helps you in mastering the correct breathing techniques. If you do Pranayama regularly, it will help you in getting better sleep, greater stamina, lower blood pressure, and much more. You can also get rid of headaches and migraines. These are the best yoga apps for beginners, intermediates or advanced. Most of them include all types of yoga like power yoga, hot yoga, Yoga for weight loss, Bikram yoga and more. So, you don’t have to worry about installing different apps for every kind of yoga. DO share your experiences with us after using any of these yoga apps.